Users interact with a Chatbot via a chat or messaging interface, imitating a conversation. After a series of questions and responses, users should arrive at an answer or product. Chatbots have moved on from their beginnings as a text-based response tree to now include elements of Artificial Intelligence such as Natural Language Processing. The most common use for Chatbots is for customer service. The Chatbot can answer the simpler customer queries, leaving the complex answers to the ‘living’ employees. 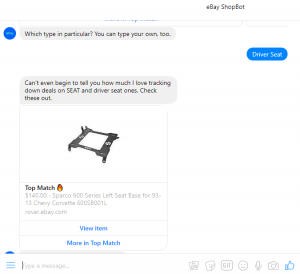 So Chatbots might be a good substitution for human customer service, but are they the next big thing for eCommerce sites? Chatbots can provide an intelligent interaction, but do shoppers really want to have an interaction when they know what they’re looking for? 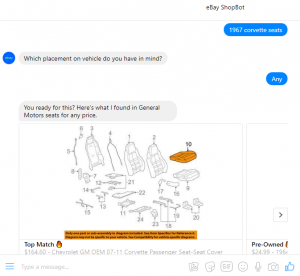 Chatbots can provide a novel user experience, but when it comes to customers who are searching for a specific product or service, Chatbots cannot be a substitute for good search. A Chatbot is only as smart as the engine behind it. Take the example of a customer looking for a leather sofa. Using a Chatbot, the customer may have to navigate through a series of questions to narrow down their search. They might select ‘Living Room Products’, followed by ‘Sofas’ and then be presented with a list of attributes, such as brand or size. Eventually, the customer may be presented with the option to select a fabric, where they can choose a ‘leather’ sofa. 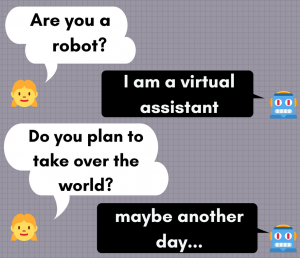 A Chatbot is typically pre-programmed with the order in which it will ask the questions and a customer may have to answer four or five questions before the most important question is asked. Compare this scenario to a great search system, where the customer can ask for a ‘brown leather sofa under $1000’ using the search box and see exactly the right products. 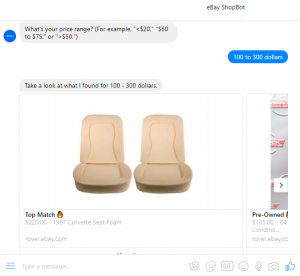 We thought we’d give eCommerce giant eBay a chance to wow us with their Chatbot capabilities before it stopped taking orders on September 6, 2018. We compared the same search with its regular site search results. It was necessary to click on one of the options regarding placement before results were presented. The first result shows seat covers rather than seats and the subsequent products available to view by clicking through the carousel were seat parts or tools, and not actual seats either. Once a price range was identified, the first result is indeed Corvette seat foam. Subsequent products in the carousel are seat brackets or assembly items. Although the first result is a seat belt, the following results are 1967 Corvette seats, as requested, and the site search also provides the customer with a choice of products. Even though the Ebay Shopbot appeared clever, it was still quite painful compared with simply running a search. If a shopper knows what products they are looking for, their choice is to either spend 2 to 5 minutes taking part in a question and answer session or to simply use intuitive search. Do shoppers want to have a chat with a computer or find the right products the first time they ask? As Chatbots become more intelligent with advances in Natural Language Processing and Machine Learning, it would be easy to assume that they are a cure-all, but let’s not underestimate the necessity of great search. A Search Box query combined with intuitive Natural Language search technology will speed up a customer’s route to checkout. Instead of customers spending time interacting with a Chatbot, intelligent Search creates a faster track to a product or service, and therefore improves conversion rates. Do you want EasyAsk’s advice? Don’t rush to deploy something that will bring down your conversion.